As others have written about, Apple appears to be making a hash out of the ability to automate tasks on macOS 10.14 (Mojave). I get it. In the age of hyper-connectivity there is a continuous assault on our computing environments by bad actors looking to extort some cash or otherwise ruin our day. Something needs to safeguard our systems against random scripts aiming to misbehave. 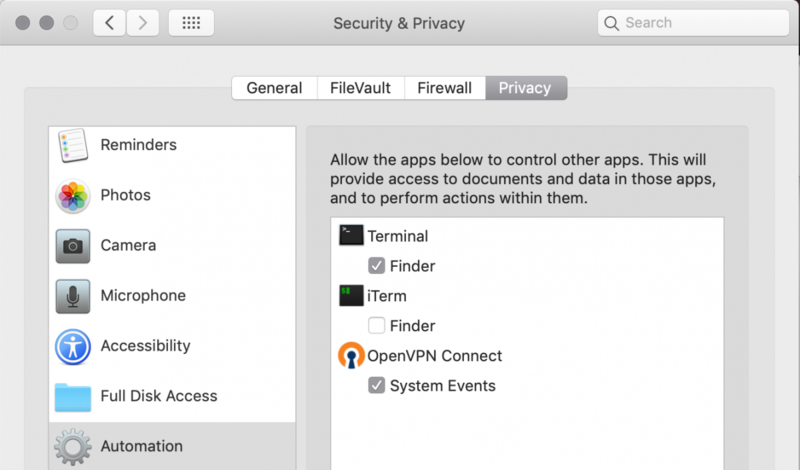 Enter Mojave’s enhanced privacy protection controls and event sandboxing. With earlier versions of Mojave the new event sandboxing mechanism was considerably flaky. In some versions (notably Beta 4), you’d intermittently be presented with Not authorized to send Apple events to System Events when attempting to execute AppleScript applications. As of Mojave Beta 8 (18A371a) I have found that the authorization functionality is at least consistent in prompting you for permission. If you’ve already given permission (as shown in the example Privacy panel below), the AppleScript tell will succeed and you’ll see something like -2560, 0, 1920, 1440 (the bounds coordinates). But wait, there’s more! If you had previously given permission, and then revoked it by unchecking the permission in the Privacy panel, you’ll get execution error: Not authorized to send Apple events to Finder. (-1743). A lot of folks (myself included) write AppleScript applications that perform some set of tasks. That is sort of the whole point of automation. Again, I get it. If my machine is compromised with a rogue application or script, it could do some serious damage. But that will always be the case. Now I can imagine how this will be resolved, and it’s going to include me forking over some money to get a verified publisher certificate. My certificate will be signed by Apple, and that signing certificate will be trusted by the OS a priori, and I’ll have to sign my scripts somehow, and so on. That’s the only way I can see this panning out, unless the plan is to literally break the automation capabilities with AppleScript. If you envision a different solution, please leave a comment!